Each January, the French celebrate La Fete des Rois. Celebrations feature a puff pastry and frangipane cake with a coin baked into it. The lucky person whose slice of cake has the currency gets to be King (or Queen) for a day. Collectors can appreciate this tradition—the lucky coin collector who sees the value of their historic gold or silver coin increase in value also feels like royalty. American coins originated in the eighteenth century, and the history of their design and material reflect the growth and challenges of a growing nation. Many collectors enjoy acquiring these metal currency, which serve as both historical milestones and mementos of a nation’s burgeoning economic power. Coin collecting attracts audiences young and old. Because these collectibles are so closely related to the history of currency, and since currency is issued by government mints, a sense of historical context is essential to understanding and appreciating this collecting category. 1792: Congress establishes the Coinage Act, which creates the US Mint in Philadelphia and regulates coin denominations. 1794: The first U.S. Dollar coin is issued in silver. 1796: The dime is introduced. 1836-1873: The seated Liberty silver dollar, half-dollar, quarter, dime and half-dime are put into circulation. 1849: During the California Gold Rush, gold dollar coins are minted. The Double Eagle, a $20 gold denomination, is added as well. 1860-1861: Clark-Gruber Coins are issued in Denver. 1866: The five cent nickel is introduced. It is made with 75% copper and 25% nickel. 1860 Clark & Gruber $10 MS60 NGC. Courtesy of Bonhams. 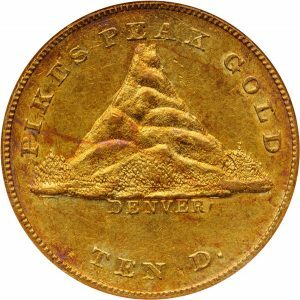 A scarce and popular “Pike’s Peak” ten dollar coin—a reference to the exaggerated design of a local mountain range on the obverse—will be at the January 2019 coins auction at Bonhams. Rarity and its excellent condition explains the $22,000-25,000 estimate on this piece of American numismatic history. Planchet: The term for the (blank) piece of metal on which a coin is stamped. Strike: The process of stamping a coin blank with a design. The value of rare coins is due in part to the strength of the imprint–full, average, or weak. Edge: The outer border of a coin is considered the “third side.” It can be plain, reeded, lettered or decorated. Rim: The raised edge on both sides of a coin. Not to be confused with the “Edge,” the rim helps protect the coin’s design from wear. Field: The flat portion of a coin’s surface not used for design or inscription. 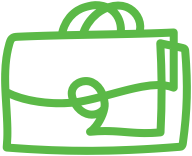 Mint Mark: A small letter or symbol on a coin used to identify where a coin was made: Philadelphia (P), Denver (D), San Francisco (S), and West Point (W). While knowing these fundamentals can make you more knowledgeable about the American coins in your own wallet, an understanding of coin history and essentials is also essential for collectors with an interest in this category. 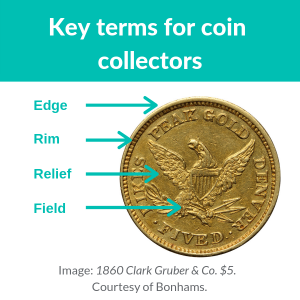 For more advice on how to care for your treasured coins, check out our upcoming article in this series, Part II: Caring for Collectible Coins. Katja Zigerlig is Vice President of Art, Wine + Collectibles Advisory at Berkley One (a Berkley Company). 1Song, Paul. Personal correspondence (email). Nov 2018. 2 "1860 Clark Gruber & Co. $10, MS60 NGC." Bonham's. Accessed 22 Jan 2019. 3 “Anatomy of a coin.” United States Mint. 20 Sep 2019. Accessed 22 Jan 2019. 4 “US Coin History: The Mint Branches Out.” US Coin Values Advisor. Accessed 22 Jan 2019. 5 “History.” United States Mint. 19 June 2018. Accessed 22 Jan 2019.